London England October 20 2018 A man who plunged 120ft from the top floor of Westfield Stratford City shopping mall has been arrested for GBH after landing on a woman who has been left with life-changing injuries. Footage posted online showed onlookers screaming after the man fell at the complex in east London at around 4pm yesterday. Pictures were also circulated of two people lying on the floor being tended to by emergency responders. Police have confirmed today a 24-year-old man has now been arrested at hospital on suspicion of GBH and reckless endangerment of life and the woman has been left with life-changing injuries. Horrified witness Kelly Buttle told the Mirror Online today the man fell through ‘mid-air’ as she sat down to have something to eat in the food court. The 21-year-old said: ‘I was just sitting down on the phone waiting for my best friend to arrive. And I was just looking forward kind of day dreaming and suddenly I just saw someone fall right in front of my face. ‘There was no sound made by the person that was falling, it seemed so silent, and then when they fell I heard the loudest smack on the floor. ‘I saw bags on the floor and when I stood up to see what had happened I saw two people lying on the floor in complete silence. One shopper told how she was making her way towards the escalators on the floor beneath. She said: ‘It was so, so quick, it was the last thing I was expecting. ‘I was walking towards JD sports by the glass when I saw a flash in the corner of my eye. ‘It didn’t look like a figure but something falling. I was too far away to see what it was. ‘Everybody was running and rushing and shouting that he’d dropped. ‘I was panicking and in shock, I thought somebody had a knife. ‘I was so worried. I thought somebody got stabbed and when I looked down, I was shocked. ‘I saw the lady laid out on the floor on her back and everybody running towards her and crowding around. ‘She was conscious but her eyes were rolling into the back of her head like she was dizzy. Onlookers watched in shock before security started to clear the area minutes later. A waitress confirmed the man fell over the glass barrier by Caffe Concerto on the top floor but did not know how it happened. Another shop worker on the second floor said: ‘I heard screaming and when I went to the barrier. A Met Police spokesperson said: ‘Neither person’s condition is deemed to be life-threatening, however the woman’s injuries are believed to be life-changing. ‘The man, aged 24, was arrested at hospital on suspicion of grievous bodily harm and reckless endangerment of life. 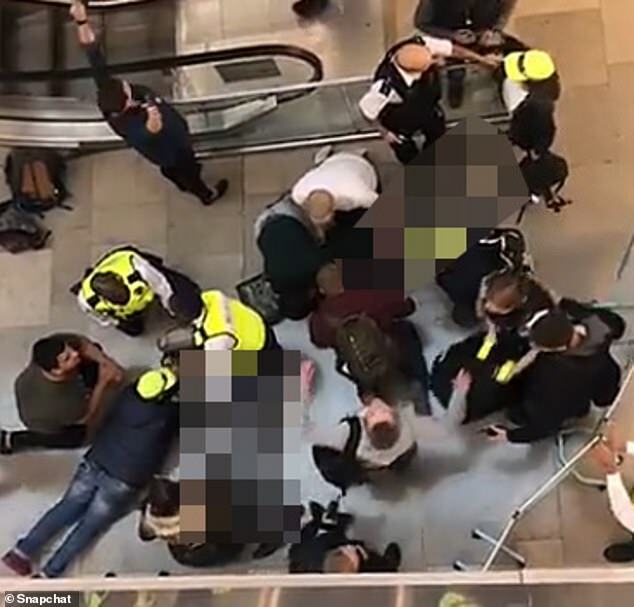 A video taken in the immediate aftermath of the fall showed three security guards urging members of the public to give space to allow paramedics to reach the two people on the floor. The incident occurred next to an escalator close to the food court in one of the busiest parts of the centre. Today a spokesman from Westfield said: ‘We are deeply saddened to learn that a woman injured yesterday is believed to have life-changing injuries. People were seen peering down from the upper floors before a cordon was put up to obstruct their view. Tatiana Baio, who was working in the Disney Store on the ground floor of the shopping centre during the incident, told MailOnline: ‘I just saw a load of people running towards the place where it happened. ‘I got a bit scared and customers were a bit surprised after it took place but it’s been a normal working day. An anonymous witness told Essex Live: ‘I was walking through the shopping centre to get to the station when I saw the barriers. ‘They landed right outside the food court, which is the busiest place. Others expressed their disbelief on Twitter, with one woman writing: ‘It was crazy! I saw the man mid air and then saw his friend on the middle floor looking around for him. The main part of the shopping centre has three floors. The top floor is thought to be around 120-feet high. The Metropolitan Police confirmed the incident yesterday afternoon. ‘Police were called at approximately 4pm on Wednesday, 17 October to reports of a man fallen from a height and a woman injured at Westfield Shopping Centre, Stratford,’ a spokesman said. The London Ambulance Service said: ‘We were called at 3.59pm today to Westfield Shopping Centre, Stratford to reports of an incident. The incident yesterday was a chilling echo of a similar incident in 2013, when a teenager was seen hanging from a second-floor balcony by his fingertips before plunging to the floor and crashing a 47-year-old man. Security guard Lakhdar Segar, 31, rushed to help when an onlooker told him the 18-year-old was about to jump, but could not stop him. ‘I looked outside and I saw a man hanging onto the balcony by both hands and dangling over the edge,’ Mr Segar said. The two men were taken to hospital and later recovered. Police later said the teenager had been attempting to commit suicide.